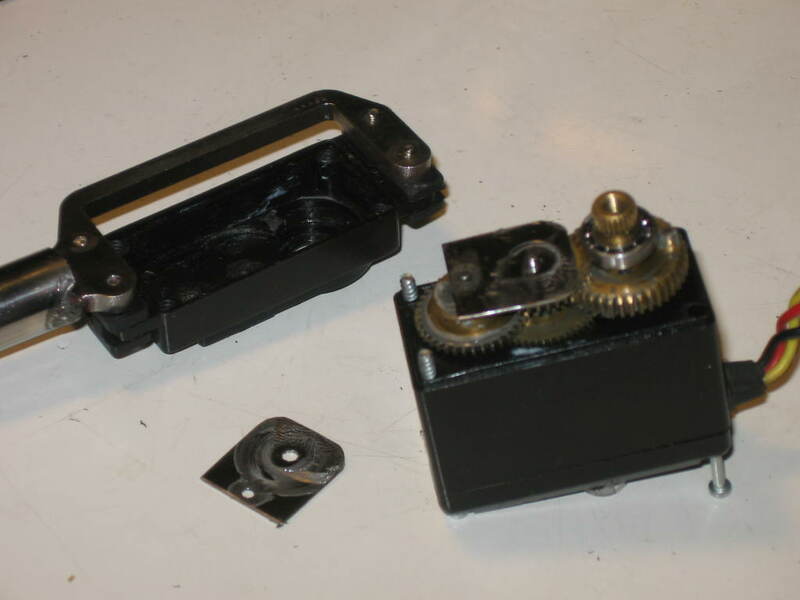 After the gears, the next weak spot in the HX-12K servos is the case. I cracked several mounting tabs at GenCon last year. That problem seems to have gone away once I switched to larger rubber grommets around the mounting screws, and made sure all four screws were evenly tightened to spread the load. One servo cracked where I had installed a rear hinge point on the case, but that appears to have been an isolated case, probably due to assembly error on my part. The main failure point now is the mounting of the axle shafts inside the gearbox. The gearbox main shaft is mounted by two ball bearings. I've yet to see that fail. The smaller hears inside the gearbox are located by two smaller shafts, which fit into plastic pockets in the gearbox housing. More expensive servos have brass bushings or even small ball bearings for the intermediate gear shafts, but the HX-12K and even the more expensive HS-5645MG servos have bare plastic there. I have seen on many servos, the HX-12K in particular, these mounting holes widened and even gouged out, allowing the middle gear in the servo to wobble back and forth. This lead to the geartrain coming unmeshed, locking solid, or even in one case a gear wandering into the side of the gearbox housing and gouging grooves in it. As an experiment I took a few servo cases that were already trashed this way and carefully shaved out all remains of shaft mounting on the inside of the case. Then after carefully measuring an intact servo, I drilled and cut some .020 steel sheet to make locating plates to hold the top ends of the two intermediate shafts. Cutting and drilling by hand, it took several tries to make the locating plate precise enough for the gears to mesh properly and for the servo to run smoothly when reassembled. When the first servo I modified this way ran well during testing, I modified three more. All four of the outer leg servos on the robot, the ones which raise and lower the leg segments, are now heavily modified hybrid models, having motors and control boards from HS-5645MG servos, the gears from HX-12K servos, and HX-12K cases modified with rear axle points and steel plates locating the intermediate gear shafts. The inner servos, which move the legs horizontally, don't seem to fail nearly as often, so I haven't modified them as much yet.